The evening started with a speech by Jiels van Barren – Director of Ghazala Productions. This press conference is the launch of the whole project. Jiels Van Barren thanked the Minister of Tourism for being here and thanked also the Governor of Luxor for his enthusiasm from the beginning for the project. The project started with the book “The Magic Flute of Mozart” written by his colleague at university Dr. Tjeu van den Berk. The Opera of Mozart is a story of light and dark, to be specific, light, dark and light and the transformation from bad to good. The whole story of the Magic Flute is in fact an Egyptian story. Jiels van Barren asked his friend, have you ever been to Egypt, he replied, no. So eight years ago he started to travel all around Egypt. 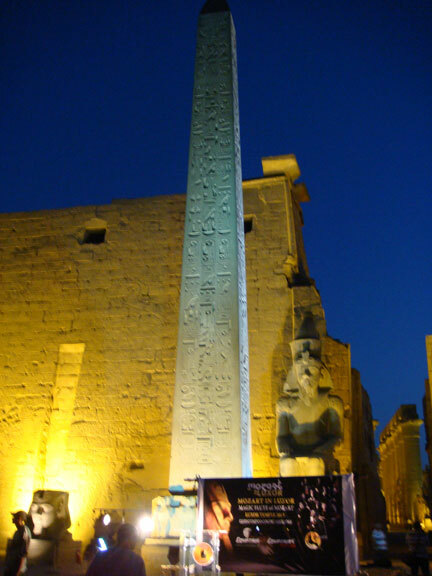 During this period the idea came of having this opera in Egypt and specifically in Luxor. It took a few years. The Magic Flute is a story about Egypt. Jiels van Barren is especially glad to have it here next year in the Temple of Luxor because it is the story about coming from the dark to the light. The eight performances will start from 5:30 in the morning, of course this is quite uncommon because in Europe it is very cold there, but in Egypt this can be done. During this event there is also a conference. The conference will be lead by his colleague Dr. Tjeu van den Berk who wrote the book. Many scholars from all over the world will attend this conference. 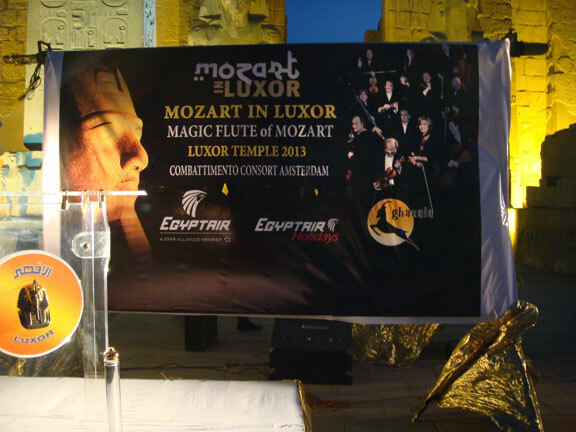 The second part of the project are song performances of Mozart in Egypt. They have never performed before in Egypt. This will be the first time next year in the Temple of Luxor. 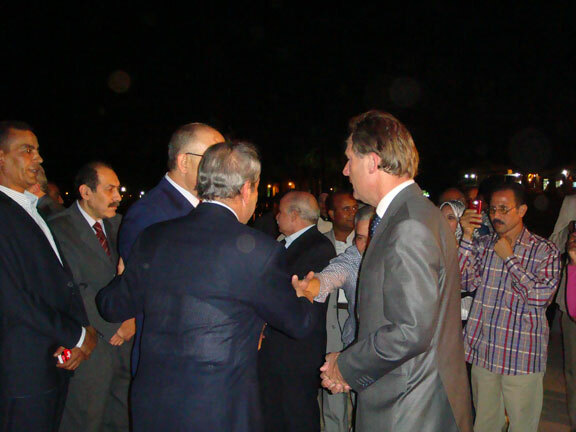 Jiels van Batten hopes it will bring a lot of profit to Egypt. 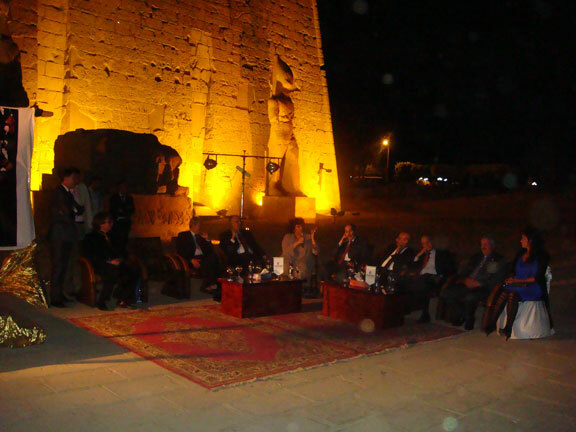 In November 2012 the performances will be held in Cairo and then in Luxor the following October 2013. All in all it was a good evening. There were many dignities, the Governor of Luxor and the Minister of Tourism, TV stations and press reporters from all parts of Egypt. This truly will be a great event. 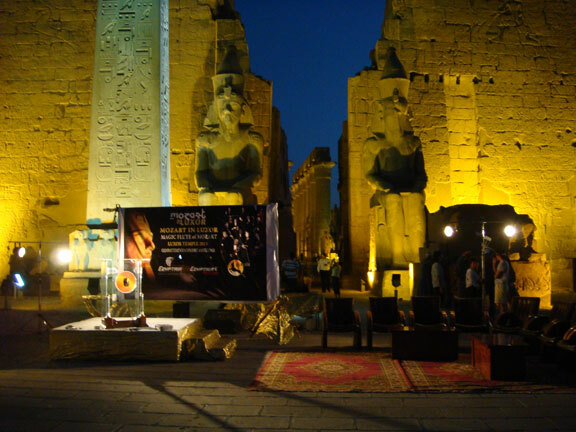 It will be staged in the Luxor Temple in October 2013. It is sponsored by Egypt Air Holidays. 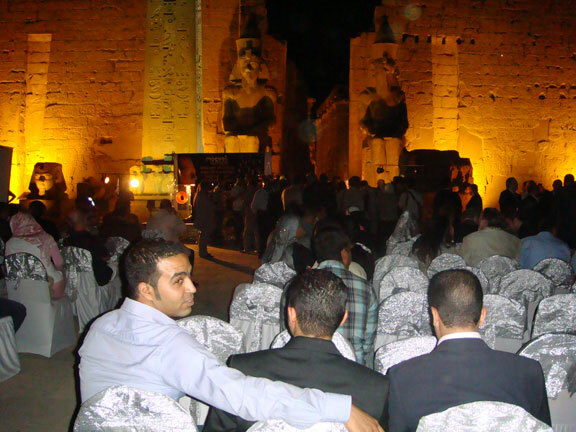 The program contains two performances both inside Luxor Temple. The opera the “Magic Flute of Mozart” will be in eight performances by the Combattimento Consort Amsterdam, conducted by Jan Willem de Vriend. 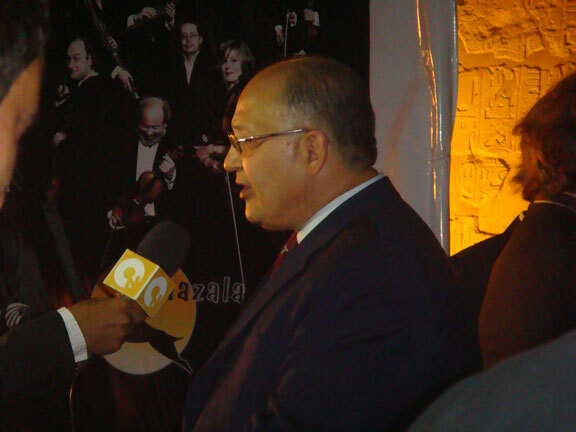 The second performance is the musical premiere of Mozart in Egypt, an encounter between Mozart’s music and old Egyptian music directed by Ahmed El Maghrabi. Egypt Air Holidays are expecting up to 9,000 people to arrive in the two weeks. They will stay in hotels, visit Aswan, Abydos, Dandarah and visit many sites in Luxor. Jiels van Batten told me that the cost of the performances in Luxor will be around 4,000,000 euros. These are some of the dignities. 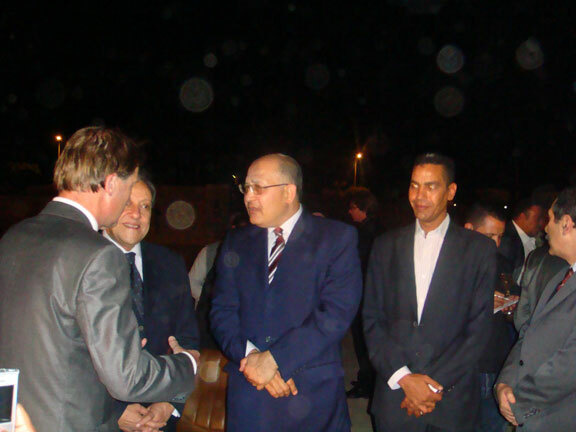 The gentleman with glasses on the left is the Governor of Luxor, in front of him is the Minister of Tourism. 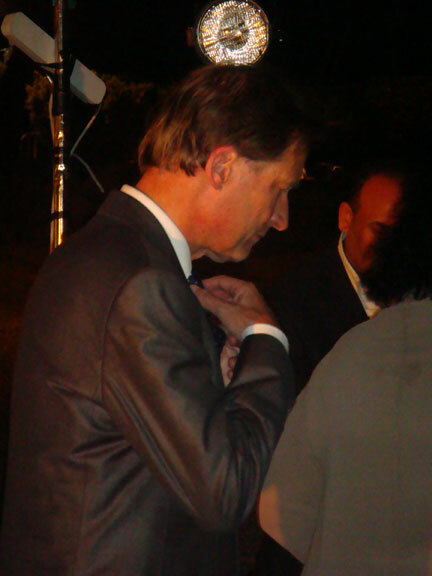 In the grey suit is Jiels van Ballen – Director of Ghazala Productions. Jiels van Ballen - Director of Ghazala Productions. 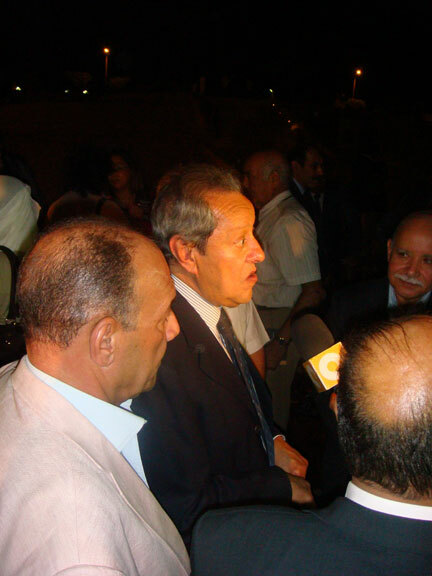 Director of Ghazala Productions, Minister of Tourism, Governor of Luxor & Bodyguard.